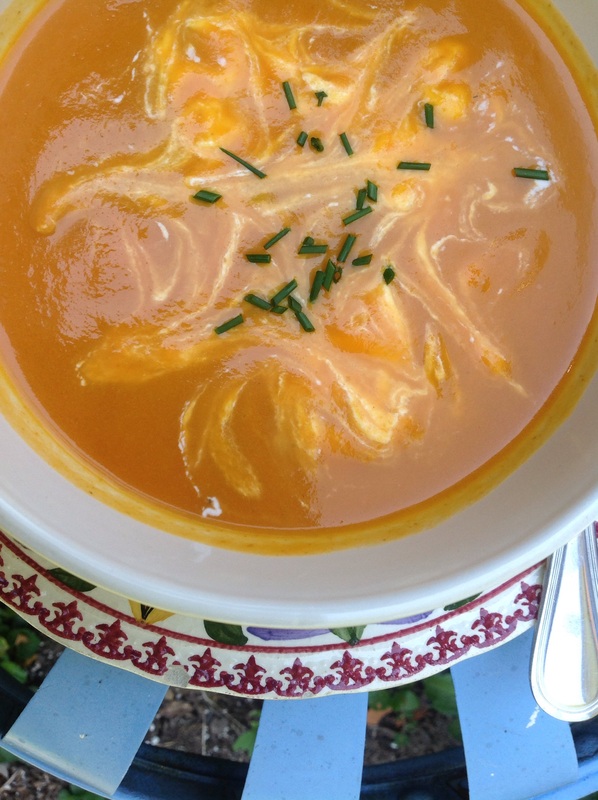 Chilled soups are refreshing in hot weather. 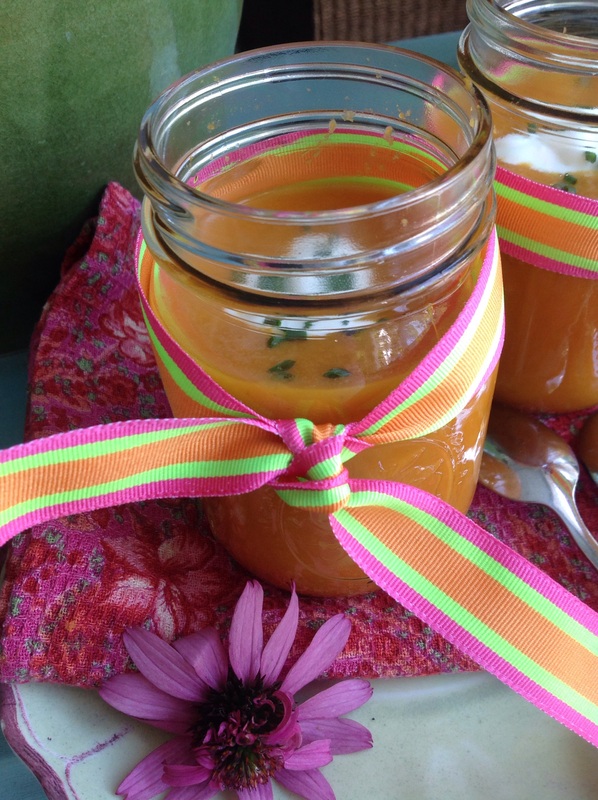 This one transforms garden carrots into a velvety purée with ginger and honey imparting great flavor. Quick and simple, it can be made ahead a couple of days or frozen for future use. To serve, it can be fancied up with a dollop of crème fraîche and chopped chives but is equally good plain. The same recipe can be made to serve hot as well. 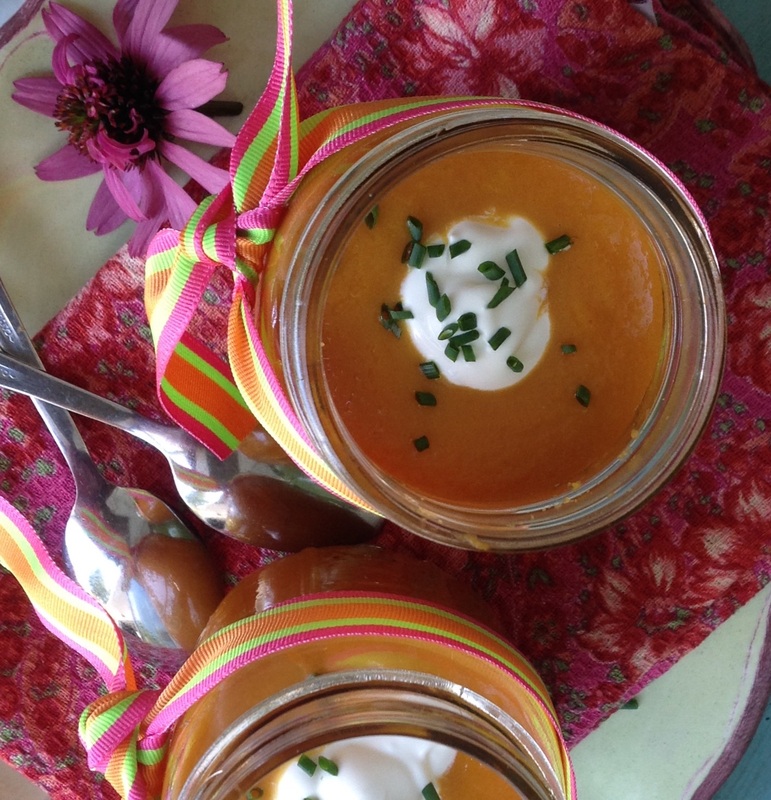 I recently brought this soup to a friend and served it in Mason jars to travel easily and in style. In a large pot, heat oil to low-medium temperature and cook onion until translucent, being careful to not brown. Add garlic and carrots and cook for 5 minutes, stirring often. Add broth and ginger, bring to a boil, cover and reduce heat to simmer and cook for about 30 minutes until carrots are soft. Let cool. Add honey and purée in blender until soup is smooth. Taste and season with salt. To serve, add a dollop of crème fraîche and chopped chives, if desired. Carrots are not only orange in color, they also come in purple, white, red and yellow. There is as much calcium in 9 carrots as there is in a glass of milk. Carrot flowers are known as Birds Nest, Bees Nest and the Devils Plague. The average person will eat 10,866 carrots in their lifetime. Holtville, Ca calls itself “The Carrot Capital of the World”. Howard Hughes always measured every carrot he ate. Researchers at the USDA found that study participants who consumed 2 carrots per day were able to lower their cholesterol levels about 20% due to a soluble fiber called calcium pectate. Carrots were first grown for medicinal uses, not as a food. French Tobacconists used to put a carrot in their bins to keep their tobbaco from drying out. Three carrots can give you enough enery to walk 3 miles. If you dream about carrots it means you will have prosperity and health. In America, the wild carrot is known as Queen Anne’s Lace, wild carrot, rattlesnake weed and American carrot. The carrot is a member of the parsley family. 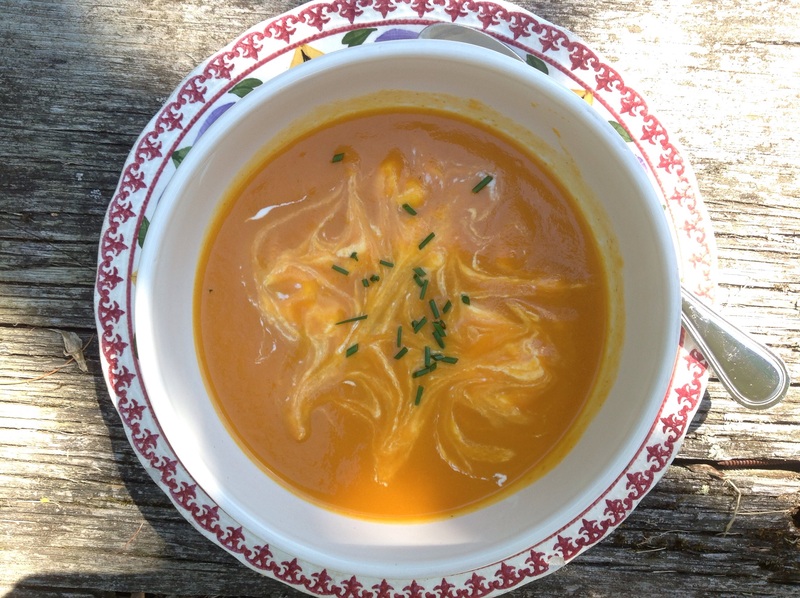 This entry was posted in Recipes and tagged Carrot ginger soup, chilled carrot ginger soup, chilled carrot ginger soup with honey, Chilled carrot soup in Mason jars by Johanne Lamarche. Bookmark the permalink. Thanks Loretta! I wanted this meal to be cheerful for its recipient and didn’t feel a tupperware container would do the honors. I also didn’t want the friend to have to return the container so Mason jar it was! Just made this dish and shared it with a friend, using a mason jar. We both loved the refreshing taste and it was so easy to make. Great recipe Johanne. Thank you Nell! Glad you enjoyed it!